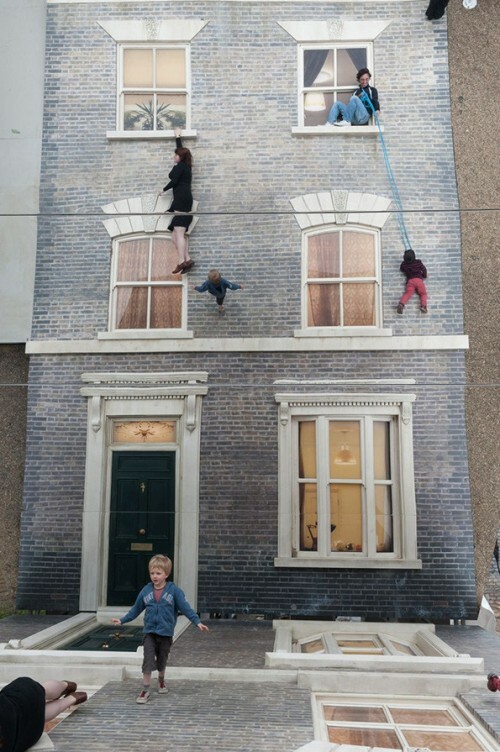 Argentine artist Leandro Erlich has been commissioned by the Barbican to create a new installation in Dalston. Resembling a theatre set, the detailed facade of a Victorian terraced house lies horizontally on the ground with mirrors positioned overhead. The reflections of visitors give the impression they are standing on, suspended from, or scaling the building vertically like so many acrobats. Erlich’s installation will be accompanied by talks, workshops and live performances, exploring themes of architectural history, urbanism and perception. More, here. This entry was posted in happenings. and tagged acrobats, art, artist, Barbican, installation, Leandro Erlich on June 28, 2013 by owls house london.. This is fascinating and so strange too! isn’t it; i love how the viewer is a player, too..